Knifes are very important in our modern society. There are many different kinds and tons of uses. However, simply owning a knife will not insure that it cuts properly. After a while, knives become dull and don’t cut as well. In fact, dull knives are actually more dangerous than sharp ones. 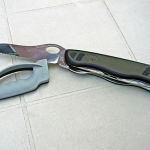 Traditionally, a sharp knife should not slip or cause accidents, and in extreme cases, getting cut by a sharpened knife will insert clean and with reduced damage. In order to properly sharpen your knives, there are several things you will need to know and a few things you will need to purchase. In order to sharpen any knife, you will need a couple of things. First, the most important part of the sharpening process is achieved with a sharpening stone (also known as a whetstone). Sharpening stones are either man-made or actual stones, typically about two inches wide and about six inches long. They can be pretty cheap or pretty expensive depending on the type. The sharpening stone is what does all of the sharpening. You could purchase a bench grinder to do the job as well, but those are much more expensive and you would have to purchase one of very fine quality or else it will just damage your blade. There are a few different kinds of sharpening stones available. All of the stones are unique in their own ways, each type of stone has a different availability of grit. Grit is important as different kinds of knives require different densities of grit in order to sharpen properly. The grit of sharpening stones range anywhere from very fine to very coarse. Different kinds of stones are available in certain densities of grit. Also, there are two other products you can use to make your blade not just sharp, but very sharp. If you want your knife to be incredibly sharp, you will need a rod of honing steel and a piece of flat leather. The honing steel will bend the very edge of your knife to the proper angle and the leather will remove any blemishes or excess steel stuck on the knife. It does not matter how large the leather is, as long as it is flat and long enough to slide your blade against. These aren’t necessary, but they will insure your blade is the sharpest it can be. All products can be found at hardware stores, convenience stores, websites, flea markets and yard sales. Depending on grit density, price, effectiveness, and long-lasting; each stone holds its own unique qualities. One of the most popular types of sharpening stones available are oil stones. These stones are usually man-made and include oil that is used as lubrication. The oil helps the stone last longer by preventing clogging and glazing of the stone. Stones without lubricant can become ineffective due to those issues. These types of stones are generally pretty cheap. They are available in medium and coarse grits. Some people don’t care for this type just because oil is slippery and accidents are possible. Fine grit oil stones are possible but do not work well. Another type of sharpening stone available is a water stone. These are great sharpening stones specifically in the fine grit area. They sharpen quickly and effectively, but ware off rather quickly. After a while, you will need to flatten the stone or purchase a new one. They are also fragile and break easier than the other stones would. These stones are usually pretty affordable but can be expensive. Also, the third type of sharpening stone available is a ceramic stone. These stones are only great if they are of a fine grit, much like water stones. Except these stones can last an entire lifetime if taken care of properly. They cut metal quickly and do not need any lubricant. Since they have a very hard surface, they can cut knives to be extremely sharp and are able to last a very long time. These stones can be a little pricey but can be pretty cheap too. The final type of sharpening stone available is known as a diamond sharpening stone. These are pretty expensive, in fact, the most expensive. They are made of steel that is encrusted with small bits of diamond that has been flattened. Most of them have holes inside of them that catch the falling steel. These stones cut super fast and are the flattest type of stones available on the market. These enables them to be the finest source of grit possible. They are available in all kinds of grit though, and they also last a very long time. There are some other types available, but these are the most popular. Of course, when you sharpen a kitchen knife, you can’t just grab any stone and start sharpening. It is important to know that these types of knives require a specific grit as well. When it comes to kitchen knives, you actually need two different kinds of grit. This is due to the fact that these knives have both a primary and secondary edge. When you first sharpen the knife, you will need to use a coarse grit stone. Typically, it is best to use either a diamond stone or oil stone for this. A diamond stone would work better, but depending on budget, a simple oil stone would work great. For the secondary stage, you will want fine grit. You could use either a water stone or ceramic stone. A ceramic stone will probably cost more, but it will help in the long run since they last much longer. Pocket knives aren’t too much different than a kitchen knife. They are somewhat similar to how kitchen knives are shaped. They have requirements for both kinds of grit. The only major difference with this kind of knife is that it pretty much requires lubricant. It is best to purchase either an oil stone or simply to buy mineral oil and place it on the stone. You want to start with a very coarse grit stone, and afterwards move on to the finest grit stone you can afford. The more fine the grit is, the sharper the knife will be in the end. Best Stones for Sharpening Saws, Axes, Machetes, Hatchets and Etc. There are many different types of knives available with hundreds of uses. Some of the knives contain multiple edges that must be sharpened differently, but generally, a diamond stone will usually work best. It is better to use a lubricated stone for any edge that needs a coarse grit. For knifes like machetes and axes, a fine grit is needed. As always, the finer your stone the sharper it will become. If you are just beginning to sharpen your knives, you don’t need to buy anything very expensive. It is best to just start off cheap and work your way up the ladder. This may all sound complicated, but in reality its actually pretty easy. It really is just a matter of understanding the difference between grits and using the right stone. Knife sharpening is actually very important. Just think about your safety.